If everything is tidy, we become more creative, relaxed and time efficient. So how can you do that if you have tens of flipbooks, or even more? The answer is easy. Start organising your flipbooks in folders and subfolders. You decide the rules which help you save time. If you're part of a team, maybe each user can have his own folder. Maybe you decide to organize your publications by months. It is up to you. 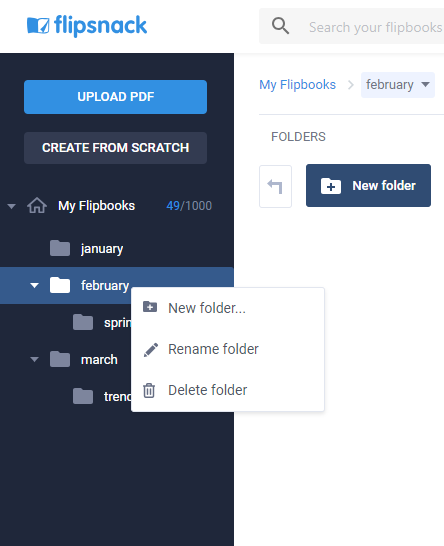 If you want to create a new folder, simply access the My Flipbooks section and then click on the New folder button. Name your new folder and click OK. It's as simple as that when wanting to create a subfolder. Click right on the folder, choose the New folder button, name it, click OK and you'll have a subfolder. Keep in mind that this feature is a free one and you can have unlimited levels of subfolders! Your folders will also appear at the top. You can see how many flipbooks each folder contains. You can find your folders in the left panel in My Flipbooks. With a simple drag & drop, you can move a flipbook from one folder to another. Remember that you can have unlimited flipbooks in your folders. Click right on the folder you want to delete, choose the Delete folder option and it will move automatically to Trash. Take into consideration that the flipbooks you had into the folder you deleted will also move automatically to Trash. If you decide to restore the deleted folder altogether with the flipbooks inside of it, simply click on Trash, then click right on the deleted folder and choose Recover. Except for the things already mentioned above, there are also others that need to be specified. For instance, you can easily keep track on your folders and subfolders through breadcrumbs. In order to access the content of a folder from the top section just double click on it. You also have a button which allows you to go back from a sub-folder to the main folder, and from the main folder to My Flipbooks. Please keep in mind that a flipbook can't be part of two folders. Once a flipbook is dragged from the My flipbooks section in a folder, you will only find it in that folder. That flipbook will no longer appear in the My flipbooks section. If you're an older user and you had a single flipbook in two different folders, you should remember that from now on, you will find your flipbook in the first folder used for this flipbook. Please keep in mind that you can drag a main folder in another one, but you can't drag a parent folder into a subfolder.